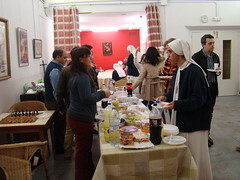 On Sunday, December 15th, we had a day encounter with the members of the Home of the Mother in Barcelona. 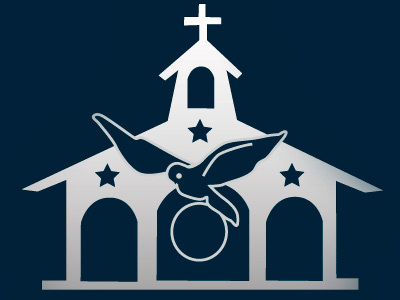 The community of Servant Sisters of Valencia left early in the morning to arrive at the 12:00 mass in St. Agnes Parish. There, everyone was waiting for us to begin the encounter. We were all very happy to see each other again. The whole group, children, youth and adults went down to the parish hall after Mass. There we began with a meditation about the Blessed Virgin, the best model for Advent, and a short time for prayer in the chapel which, during the spanish civil war, had been used as a jail for several martyrs. We ate together, and shared our spiritual experiences. We watched the H.M. television video about adoration, which opened up a discussion about this topic. 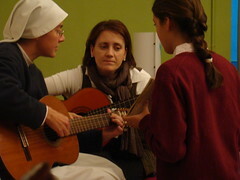 Many gave their testimonies and experiences that they have had before Jesus in the Eucharist. It was very beautiful and it encouraged us to adore the Lord and make Him be loved more. Meanwhile, some of the girls made a project that would be a surprise for the adults. We prayed the rosary together with songs, and before saying good-bye, they all received a box with a proposal and with it, more encouragement to receive the Child Jesus in our hearts this Christmas. Sadly, we had to end the encounter to return to Valencia, but we were already excited to return next year, God willing.